How Important is Wire Rope Lubrication? In order to fully understand the importance of the regular application for wire rope lubrication during the working life of stranded or full locked coil hoisting ropes, it is first necessary to analyze the function of any such lubricant. a) Each wire in any wire rope construction must remain as free as possible from adjacent wires so it can move to accommodate its allocated share of the varying rope tension it has to endure. This is especially important when the rope is performing at high speed and/or under the high wire contact stresses encountered during hoisting. Rope design is intended to minimize inter wire frictional contact but only by good lubricating practices can this effect be fully accomplished. a) Penetrate easily into the rope. b) Displace moisture from the internal and external surfaces. c) Provide good corrosion protection both internally and externally. d) Be resistant to emulsification. e) Possess good rope adhesive properties. f) Resist removal by mechanical forces. g) Possess good anti-wear properties. h) Be compatible with the lubricant already employed during rope manufacture. It should be pointed out that in the case of full locked coil and many plastic enhanced hoisting ropes, in-service lubricant is confined solely to the outside wire. This is because the inner rope is already sealed off with adequate lubrication. 1) Premature wire breaks occurring in the ropes and caused by internal and/or external corrosion. 2) Premature wire breaks occurring at the strand interstices due to lack of proper inter strand movement. 3) Strand displacement, loose wires, and rope waving, leading to loss of cross section stability. Additionally, the correct lubricant is of key importance during rope manufacture. 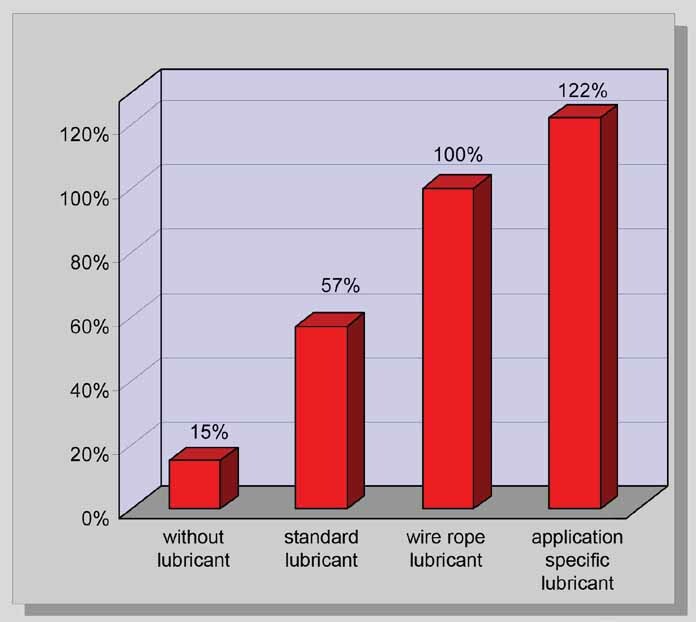 Through a German study (see chart below), it is proven that the proper lay-up lubricant can have a great effect on rope life. Northern Strands is an official supplier of Kirpatrick Lubricants in Canada.